Terrific quote I have copied them so I can refer back to them when I am in a glum mood. Which has been way to often lately. Ray Bradbury’s short stories always held me spellbound as a teenager. I wanted to stop the woman from crossing the ravine, tell the newcomer not to brag about the sun on earth, and the stories went on, absorbing and entertaining. As for his quotes, there was wisdom always to be found. Much of his sci fi rings true today, much to my dismay, and I read it over again, discovering new ideas (or my perceptions of ideas). Oh, yes, the ravine! My breath still catches in my throat, Dan! You are correct about much of his work. The genre of sci fi is so incredible in that sense. . .the way it shares bits of prophesy. I love Octavia Butler’s The Parable of the Sower for that reason (although it borders on creepy). It is well written! Oh, you’re going to LOVE Zen and the Art of Writing! Isn’t it wonderful when you find a new book by an author you love? I stumbled across Zen by accident, I think when I was browsing at a Barnes and Noble. I thought I had read almost everything Bradbury had written, but then I came upon this little gem of a book. It’s short and succinct, and he lays out his philosophy of writing. I think the take-away from his book (and everything her writes) is that you have to approach the world with a genuine sense of wonder. If you do that, you can write poetry and work magic. I like this ritual of yours, reading Dandelion Wine every summer. What book could be better for that? 🙂 I agree with you about the prose. It’s SO beautiful that it almost makes me ache. There are some types of beauty that, in their way, bruise you because they’re so powerful. For me, Dandelion Wine possess exactly that kind of beauty. I could go on and on about Bradbury, so I should stop myself here and look at the rest of your site 🙂 But I want you to know that you made my evening with those quotes. I’m sure I will! I have read little snippets and know it will be fantastic! There’s a beautiful, relatively new library close by (you know how he feels about libraries;-)) and I will check there to see if they have it. Any book in which he discusses writing must be incredible since he has the gift of “wonder!” He loves life and says that is why he has lived so long. I was happy to learn he did not write his first novel until he was 30 yrs. of age. There’s hope for me lol. You should read it too! It’s a nice way to kick off the season! Yes, since I have read it for years and years (since I was a younger girl), the meaning of the text changes nearly every time I re-read it! Isn’t that what iconic texts are supposed to do? In a sense, come alive for us (in whatever situation, time, or place life finds us)? Ohhh, I could go on and on about that text but will stop here. I might read it sooner than later. . . I could, too, and then this would be one very long commentary :-). I’m glad you liked them (although I have a gazillion more I adore) and I enjoyed your site very much! Cheers to more writing! Just finished teaching Fah. 451. Kids liked it. Fun stuff. Thank you for these quotes. Bradbury has long been one of my favorite authors and one of my biggest inspirations. 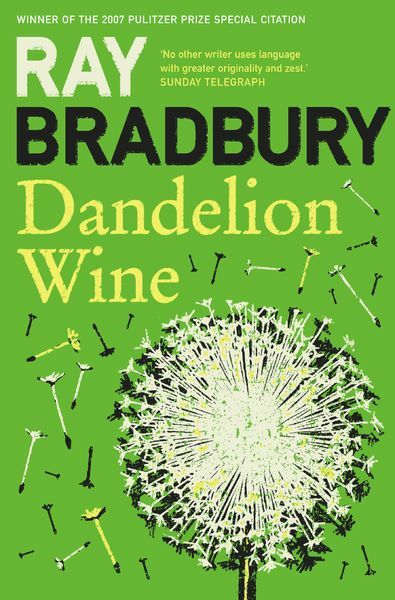 I love both Farenheit 451 and Dandelion Wine, as well as almost every short story he ever wrote. I think that anyone who aspires to write anything–essays, short stories, novels, poetry–would benefit from reading Bradbury because he does it all well. He can take a facet of reality or of the human experience and set it to perfect words with perfect rhythm and lyricism. He transcends genres. Few authors have trapped me in their language the way Bradbury has. Have you read his book on writing, Zen and the Art of Writing? One of those quotes you listed may come from that book. I don’t know, but it abounds with similar words of wisdom and encouragement. Awh, thanks for dropping by! Wow! You neatly summarized how I feel about his works (and him)! Dandelion Wine is such beautiful prose that I read it at the beginning of every summer. I can’t get enough! He does supercede genre and his words capture unexpressed realities for me. I need to read Zen and the Art of Writing. . . will look for it tomorrow. Glad you enjoy him as much as I do!